We like the baking method for removing tires from rims. Here is how we do it. – Place the wheels and tires on the cookie sheet and put it in the oven. – Wearing the gloves (This will be hot). Work the edge of the tire close to the rim and gently peel the tire away. Note: There will be a slight smell associated with this method, you are putting rubber in a hot oven. This works well with 1/10 and smaller tires. 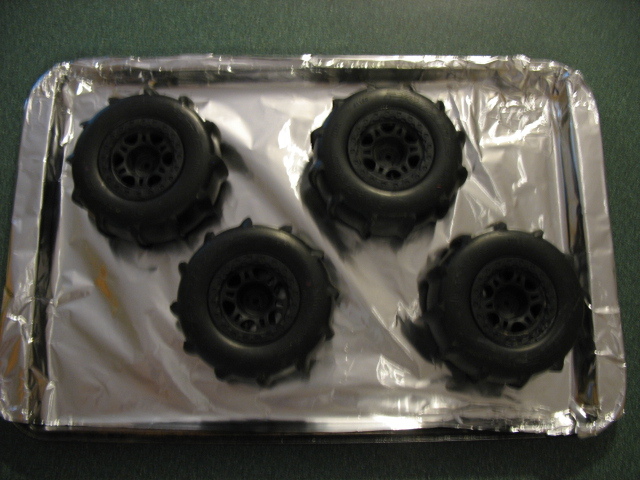 1/8 or bigger tires may require longer baking times, or an alternative method, such as boiling.